Do you feel the need to undergo a treatment for glowing and youthful skin with skin tone but afraid because of your sensitive skin? Skinology introduces a revolutionary approach to almost all your skin problems and the best part is that it is a perfect treatment even for people with sensitive skin. This is a deep cleansing process with a number of significant benefits to your skin. 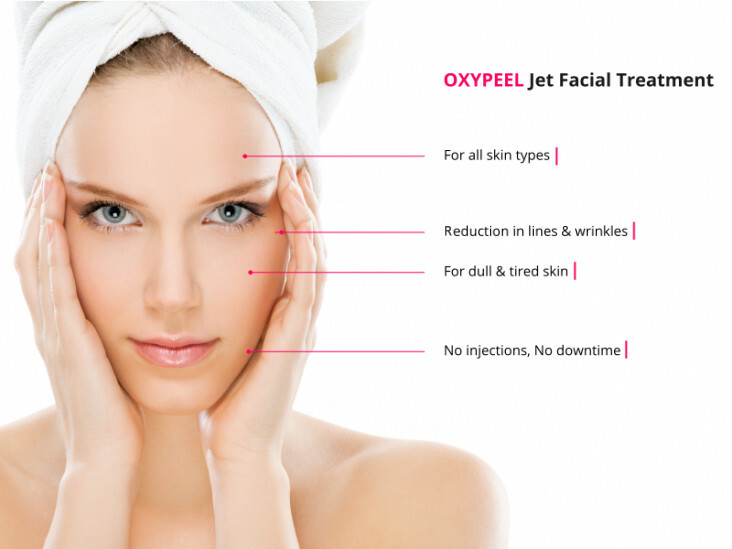 The OxyPeel Jet Facial is a soothing skin treatment which uses Jet technology to power cleanses your skin. Unlike chemical peels, OxyPeel works biologically to exfoliate and refresh your skin with specially designed microjet hand piece. Your skin is first exfoliated and hydrated by infusing oxygen & saline into the skin cells without any abrasion or discomfort. The first step then is followed by transcutaneous infusion of vital vitamins, anti-aging collagen boosters, anti-acne serums, whitening cocktails and other minerals depending on your particular skin problems. 1. Improved Skin Texture – OxePeel Jet facial includes cleansing of the deepest skin layers through biological exfoliation and therefore, is highly effective to eradicate impurities such as blackheads, whiteheads, dry and dead skin cells to give you a healthy skin texture by unclogging the pores. 2. Skin Rejuvenation – This facial treatment uses microjet hand piece to cleanse your skin layers and has been proven to remove skin pollutants such as dirt, smoke, toxins and make up that may have build up on your skin surface over a long period of time. As goes without saying your skin will feel fresh and hydrated after the OxyPeel Jet Facial Treatment. 3. Fight acne – As you read on, you’ll know why Dr. Nivedita Dadu claims that this is the treatment every woman needs. Utilizing the properties of Jet technology, oxygen and saline is infused into the skin cells which profoundly hydrates the skin at deeper levels and controls the sebum production which is the main cause of acne. It is a biological treatment and works naturally to bless you with the skin that you deserve, like no other facial treatments. 4. Lighter Skin tone – OxyPeel Jet Facial is a complete treatment in itself as it revitalizes your skin, improves blood circulation and removes skin pollutants. Providing the ultra hydration to your skin, it also confiscates the film of bacteria on the skin surface which cause various infections and discoloration of skin i.e. acne scars, pigmentation and Sun damage. 5. Youthful Skin – After reading this, you’ll understand why I said it’s a complete skin treatment. The OxyPeel helps you divest yourself of wrinkles, fine lines, skin sagging and dark circles. This facial tightens and improves the flexibility of your skin. If you’re wondering how a single treatment can beget you such astonishing results, then the answer is that it works on the basal layers of the skin where new skin cells are being generated, therefore, it works on the roots of all skin problems. 6. No downtime – The treatment is based on using all the natural components, making it ideal for almost all skin types. This includes superficial peeling and doesn’t have any side effects even on sensitive skin type. It is a non-invasive facial that treatment restores the missing lustre to give you spotless skin instantly. OxyPeel Jet facial treatment is a natural, pain-free and quick treatment which takes some minutes and the results are clearly visible after first session. As this treatment provides you optimum results and has no side effects or downtime, Skinology recommends this treatment when you want to prepare for special occasions like weddings and don’t have much time to invest in your regular salon treatments. All you need to do is avoid going into the Sun and wear good quality sunscreen for 24 hours after the treatment. And you’re ready to catch up with the world. Hurrah! OxyPeel is a water-based treatment that will significantly improve your skin in various ways. Over the period of time your skin is going to appear nourished, firm, spotless and radiant. Give us a call to know more about OxyPeel Jet Facial at +91-9958573501 or comment below for your queries.